Lancome Bi-Facil Double Action Eye Makeup Remover - After a long day of sightseeing, I'm always too exhausted to remove my makeup but this stuff makes it so easy. All you need is a cotton ball or a paper towel and pour a little bit on there and it'll remove even the toughest mascaras off in seconds. Despite it technically being an eye makeup remover, I use it on my face as well and once I've wiped everything off I just wash my face with plain old water and call it a night. It always leaves my skin so soft! Essie "Jamaica Me Crazy" - Before I go on a long vacation, I'll get a good old pedicure and gel manicure in order to not worry about my nails for a while but I always bring an extra polish just in case. Essie is my go-to brand and they always have the best summer colors that are vibrant and last a long time without chipping. "Jamaica Me Crazy" is my latest obsession and has the perfect amount of shimmer without being childish. 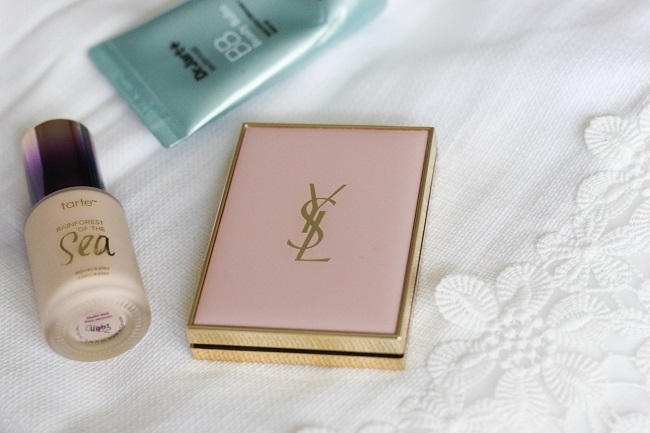 YSL Touche Eclat Blur Perfector - If you're prone to an oily t-zone like I am, then a good primer is a must. This one from YSL isn't heavy on the skin and you can wear it under or over your makeup. Plus how gorgeous is that packaging?! 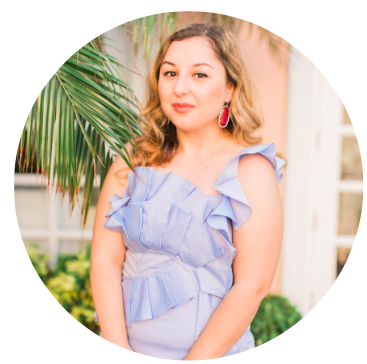 St. Tropez Self Tanning Bronzer Mousse - I hate going on vacation without having a tan and since I'm against tanning beds (um hello premature aging and skin cancer! 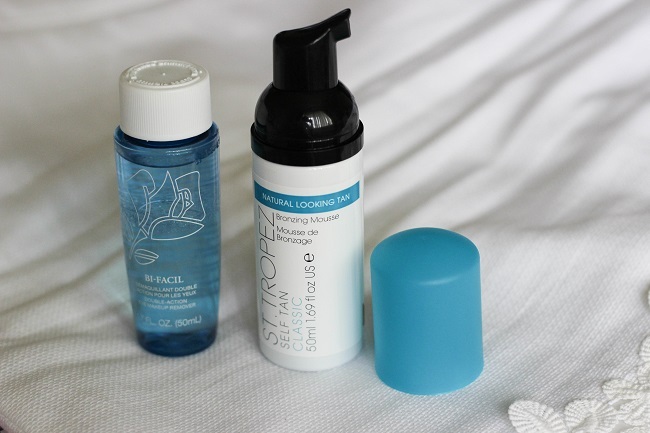 ), my go-to is St. Tropez which you can read my review here. 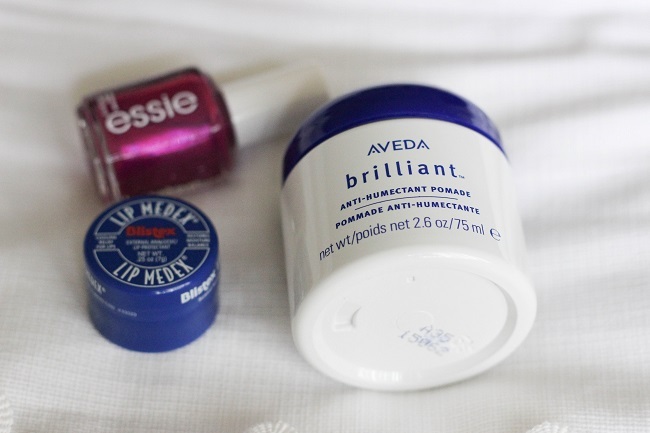 It's super easy to use, dries quick, and doesn't leave those annoying streaks. 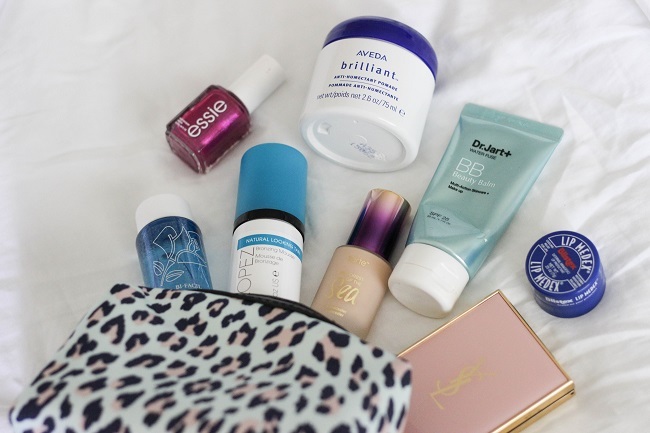 Dr. Jart Water Fusion BB Cream - My everyday BB cream that I can't live without! I can't stand the feeling of regular foundation and prefer something with light coverage so Dr. Jart's BB Creams always do the trick. They have them in different formulas but the Water Fusion one is my favorite. When you apply it, you can feel little water drops turning into cream as you rub it into your skin. It's refreshing and gives my skin a clear, natural look without feeling heavy. Tarte Rainforest of the Sea Concealor - I'm going to put up an in-depth review of this soon but this is my new favorite concealer that's super light and feels refreshing under the eyes (and I do 2 layers!) and covers up dark circles if you're stuck with them eternally like I am. Aveda Brilliant Anti-Humectant Pomade - Straight hair plus humid temperatures is a terrible combo so I've searched everywhere for a good hair product that prevents my hair from getting frizzy without making it look greasy. This one from Aveda is incredible and you only need a tiny bit so it's worth the expensive price. Blistex Lip Medex - I can't leave my house with good old chapstick and this one from Blistex is holy grail worthy. Nothing compares to how quickly this softens your lips and gets rid of dryness even in the worst places like planes. 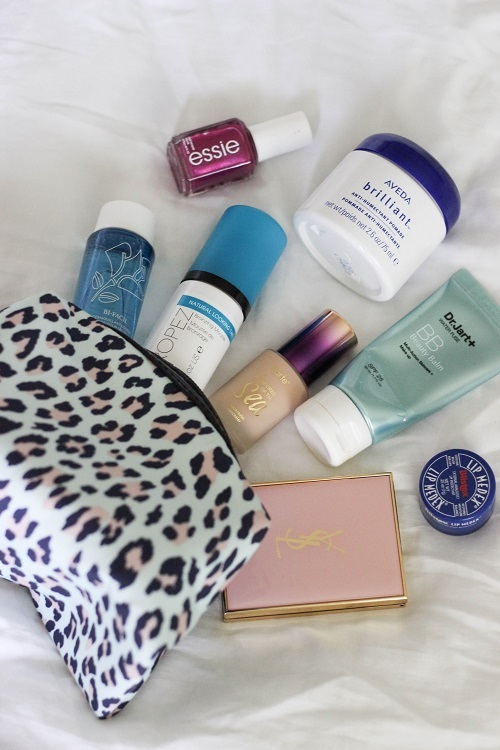 What are some of your favorite beauty essentials for traveling? I'd love to know!